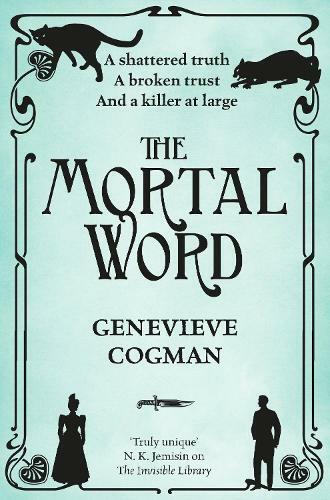 The Mortal Word is part of Genevieve Cogman's witty and wonderful Invisible Library series, which can be enjoyed as part of a sequence or as standalones. Peace talks are always tricky . . . especially when a key diplomat gets stabbed. This murder rudely interrupts a top-secret summit between the warring dragons and Fae, so Librarian-spy Irene is summoned to investigate. In a version of 1890s Paris, Irene and her detective friend Vale must track down the killer - before either the peace negotiations or the city go up in flames. Accusations fly thick and fast. Irene soon finds herself in the seedy depths of the Parisian underworld on the trail of a notoriously warlike Fae, the Blood Countess. However, the evidence against the Countess is circumstantial. Could the assassin - or assassins - be closer than anyone suspects? I'm grateful to the publisher for an advance copy of The Mortal Word. Who would kill for a book...?